What Can You Accomplish with Your Extra Time? Titan’s EasyPrice Increases Sales and Saves Time! What can you accomplish with your extra time? This topic came up when we were talking with one of our customers about EasyPrice, our mobile SAP compatible Quote and Sales Entry app. Our customer, a manufacturer and distributor, has a field sales group that submits quotes via phone calls, email or fax to the Inside Sales Team at the home office. The inside sales reps entered the quotes into SAP and then sent them back to the buyers for their approval. Our client wanted a mobile solution that could increase sales and reduce non-selling time. Their time-consuming process affected the number of quotes accepted by buyers – other bids were received from competitors, quotes had errors or changes to the quote. The entire process was inefficient, and sales metrics were not met. At the other end of the process, Inside Sales Reps were spending approximately 1/3 of their time entering the sales orders second hand. They had between 100 and 120 Sales Reps with each rep costing around $70,000 per annum. The amount of time wasted on entering sales orders exceeded $2,000,000. With EasyPrice, the field sales rep enters the quotes and upon approval, the sales orders update SAP on the back-end. They will be able to provide the quote and get approvals or modify while they are sitting in the buyer’s office. There is no dependency on the Inside Sales Reps to enter quotes and sales orders for field sales reps. Sounds like a win-win-win situation! Inside Sales Reps can focus on sales activities versus non-sales activities. Our Solution Architects and Advisors built the business case for the customer. Based on our assessment, our client was going to save approximately 17-20% of their inside sales team’s effort by not having to enter the quotes. The savings exceeded $1 million dollars annually with this productivity improvement. For a small or medium sized business, that is significant, and it all goes to the bottom line. For example, an estimated $2 million dollars or 66,000 hours was spent annually on non-sales activity – time on the phone with the field reps, entering the quotes, revising the quotes: all non-selling activities that increase the time of delivery to customers. Entering the quotes and sales orders in the field would increase hours devoted to selling by the Inside Sales Reps by an estimated 50%. In the course of the year, that amounted to 33,000 additional selling hours. The inside sales team will now be able to focus more on sales related activities versus non-revenue generating activities. 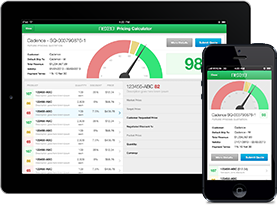 EasyPrice is a component of a suite of mobile applications developed by Titan Software. These applications are designed with leading technology, security, functionality and the ultimate user experience. For the majority of our mobile solutions projects, we seek a 10:1 ratio of savings to investment or better as presented in the business case above. We design our suite of Easy applications with your TCO in mind for Sales, Warehouses, Shipping, HR and other processes. How will you spend your extra time? For more information on Titan’s mobile solutions or how to build a business case for your mobile applications, contact Joseph Lamb, joseph@titanconsulting.net or call him at 972-743-2872. Or, contact your Titan Consulting Director. You can also see additional information on Titan Software at Titan Consulting, www.titanconsulting.net.